Had a nice walk around Johnson lake, meeting several people and seeing even more birds. There was a group of eight, from the south, snowshoeing around the lake. Half way around the lake the group had broken into three groups, some members of the party did not like the slight slope on the far end of the trail, so they decided to walk on the lake. Then few minutes later I met an English couple, who were taking easy on their snowshoes, as they day before they went for a longer and steeper trip near Lake Louise. At the later part of my walk met two ladies and one gentleman from Scotland, one of the lady was concerned I was walking by myself in the middle of the wilderness. I assured her that I would be fine and told her too keep an eye out for a woodpecker just ahead. 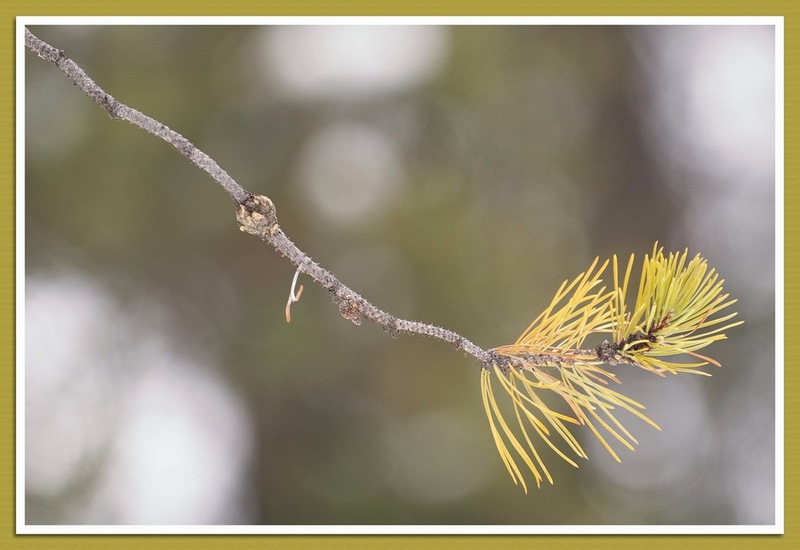 Before I started to walk toward the parking lot, I saw a Lodgepole pine with some yellow-orange colour needles on the end of several branches. Started to walk around the tree, taking pictures , looking for a soft background with the needles standing out. Attached is one of those picture.